It was one of (if not the) most action-packed games of all time - it must be Metal Slug! It was also one of the most polite (Marco always said thank you). This was a true arcade classic, and rightly we are asked all the time for metal slug arcade machines. Sadly many of the original cabinets were converted to play other games, or were simply standard Neo Geo jamma cabs. But just like Marco, our range of multi-game arcade machines has come to the rescue. 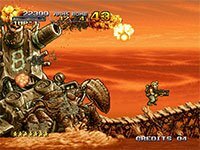 So now you can get Metal Slug and in some cases many sequels, alongside literally hundreds of other games, all on one machine. Your younger self would be in heaven.